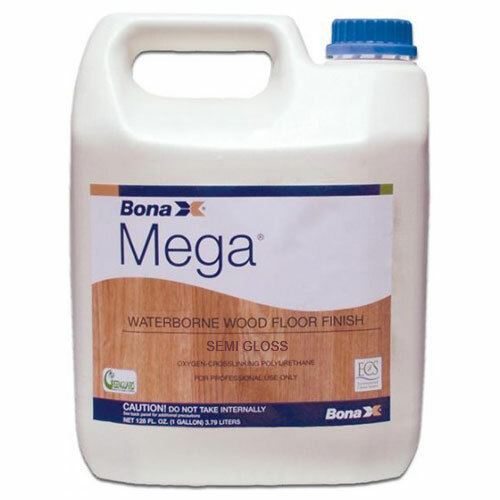 Bona Mega Waterborne Hardwood Floor Finish (semi-gloss sheen) is the revolutionary, oxygen-crosslinking, waterborne wood floor finish for use on heavy-traffic interior residential and commercial floors. Bona Mega’s unique OCP (Oxygen-Crosslinking Polyurethane) formula uses the oxygen in the air as the crosslinker. Bona Mega is the world’s leading waterborne finish, providing exceptional durability, beauty and value. • Ingredients: Water, polymeric resins, propylene based glycol ethers, silica derivate, surfactants.